The POLTERGEIST curse began with skeletons. Lots of them. The Spielberg-produced horror flick spawned two sequels, a reboot, and countless bad dreams, but according to some, the use of dozens of real human skeletons as props in the movie bred a deadly curse that continues to this day. 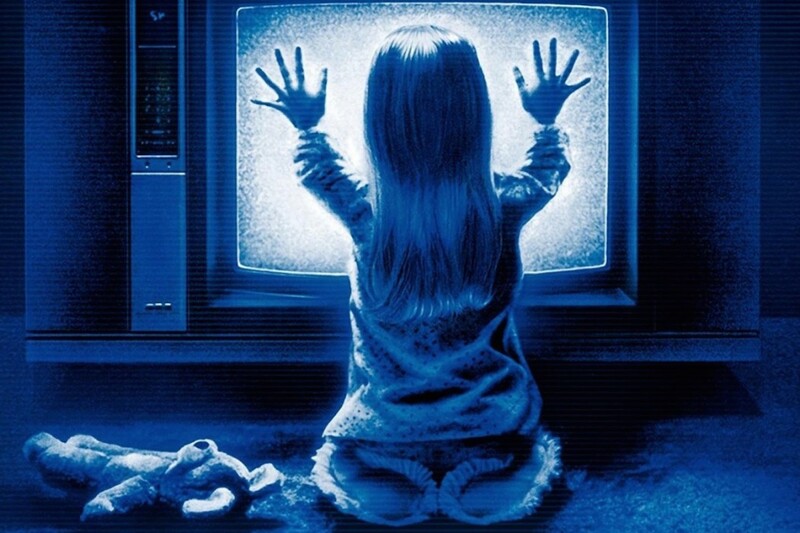 Lots of movies, particularly horror flicks, are said to be cursed (THE EXORCIST, THE OMEN, ROSEMARY’S BABY, even an unmade script entitled ATUK), and skeptics usually explain away these hexes as coincidences and/or marketing schemes, but before you dismiss the POLTERGEIST curse out-of-hand, consider the similarities between the movie and real life. In POLTERGEIST, The Freelings, a nice, upper-middleclass family, move into a new house in a prototypical Spielberg-style neighborhood. 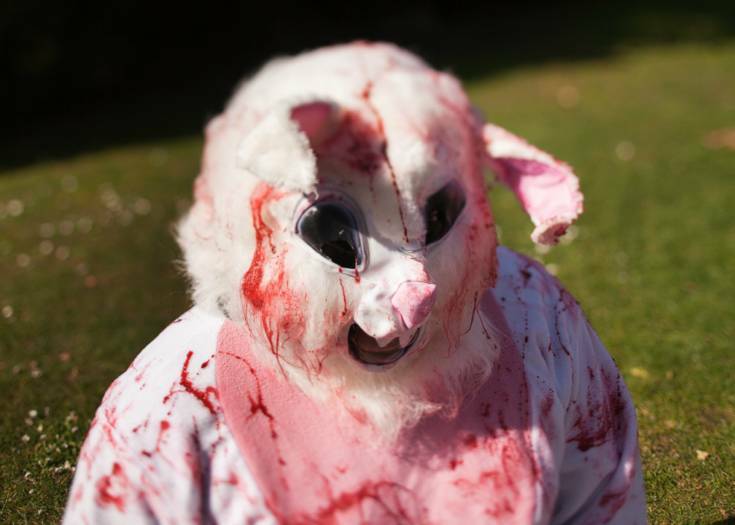 But strange things start to happen, and their suburban idyll turns nightmarish. Heavy rains unearth tons of skeletons buried beneath their home — the cheapass real estate developers built on top of a cemetery but didn’t tell anyone. Their corpses denied a final resting place, The Dead take revenge on the Freelings, ultimately targeting their children. In real life, Steven Spielberg and Tobe Hooper, two nice, upper-middleclass filmmakers, move onto a Spielberg-style film set and, without telling their actors, use actual human skeletons as props in their movie. Then strange things start happening: Lightning strikes, accidents, and more. This leads to whispered rumors (and an E! Hollywood Story episode) that The Dead are taking revenge upon POLTERGEIST’s cast, targeting the children. According to believers, the curse ultimately claimed the lives of Freeling family members Heather O’Rourke and Dominique Dunne, both of whom died very tragically and very young. If any one person represents the POLTERGEIST series, it’s actress Heather O’Rourke. 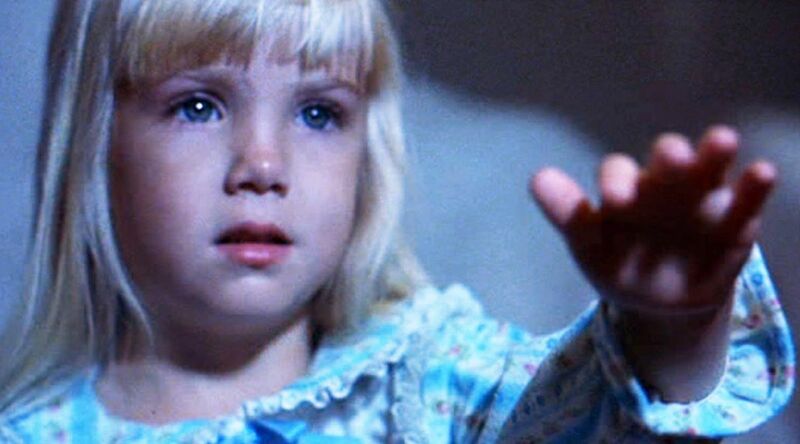 Only five years old when she starred in POLTERGEIST, O’Rourke’s Carol Anne is the soul of the franchise, the innocent targeted by Evil around which the story revolves. Her read of the line “They’re here,” transcended the movie and is one of the most remembered taglines in film history. 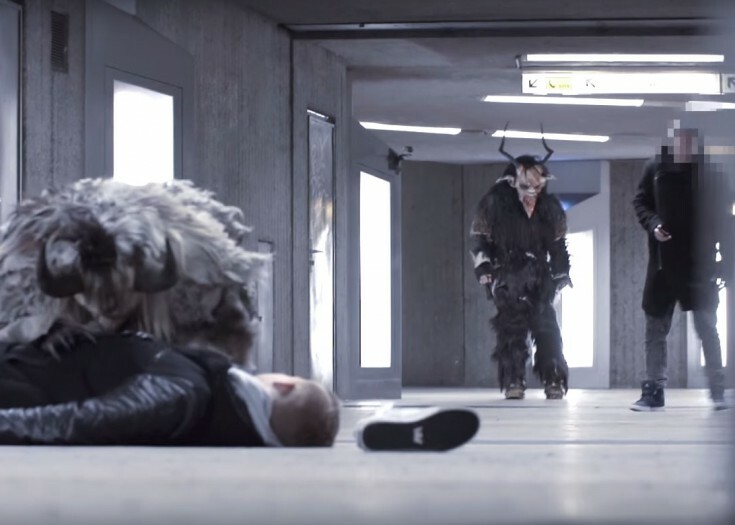 But O’Rourke’s involvement with the series may have come with a terrible price. After appearing in all three of the original POLTERGEIST movies, O’Rourke died tragically and somewhat mysteriously at only 12 years old. In the middle of shooting POLTERGEIST III, she was rushed to Cedars Sinai, where she died in the middle of surgery. Immediately after her death, O’Rourke’s manager mistakenly reported the child actor had died of the flu, but the actual cause-of-death was stranger than that. O’Rourke, it turns out, died from septic shock during emergency surgery to repair an acute bowel obstruction. O’Rourke was born with a stenosis of the intestines that was never diagnosed. Instead, doctors said she had Crohn’s disease. According to a lawsuit filed by her parents, her death could have been prevented if she had received the correct diagnosis. Dominique Dunne played Dana Freeling, the teenager daughter in the original POLTERGEIST. 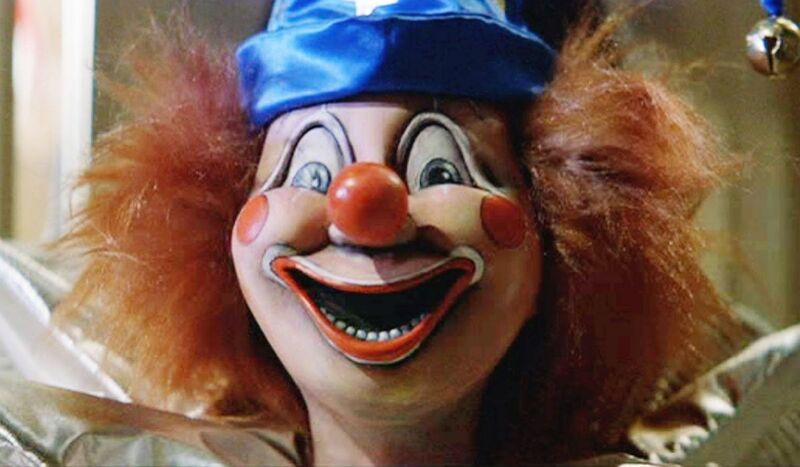 Like her co-star Heather O’Rourke, POLTERGEIST was Dunne’s first feature film. Thanks to the movie’s incredible success, Dunne had gone from small television parts to a huge film career overnight, but behind the scenes, her life was its own kind of nightmare. In 1981, Dunne began a relationship with John Sweeney, a chef at a trendy L.A. restaurant. Sweeney was, according to court testimony, an abusive, jealous, and angry man. The couple fought constantly, with Sweeney reportedly beating Dunne savagely. After a particularly violent row, where Sweeney reportedly strangled Dunne and jumped on her car hood to keep her from leaving, Dunne moved out and ended their relationship. But Sweeney didn’t take “no” for an answer. According to police reports, on the night before Halloween 1982, the chef carved a chocolate mask of Dominique’s face, and delivered it to her door. After a brief argument, Sweeney strangled Dunne into unconsciousness. When the police arrived, Sweeney told them “I killed my girlfriend and I tried to kill myself,” but he was wrong. The attempted murderer only ended up strangling Dunne into a coma. She spent four days in a coma, teetering between Life and Death, before finally succumbing on November 4, 1982. Sweeney served less than four years for the crime. After prison, he changed his name and has presumably been living as a free man ever since. The use of real skeletons on the set of POLTERGEIST was first made public by actress JoBeth Williams, who dropped the fact on VH1’s I Love the ’80s. A film crew using real human remains to dress a set seems too strange to be true, but it turns out Williams wasn’t misremembering her days shooting POLTERGEIST. “Yes, the skeletons were real,” confirmed POLTERGEIST’s assistant prop master Bruce Kasson. Prop master Kasson may not have felt the curse, but others who worked on POLTERGEIST tell of strange experiences. 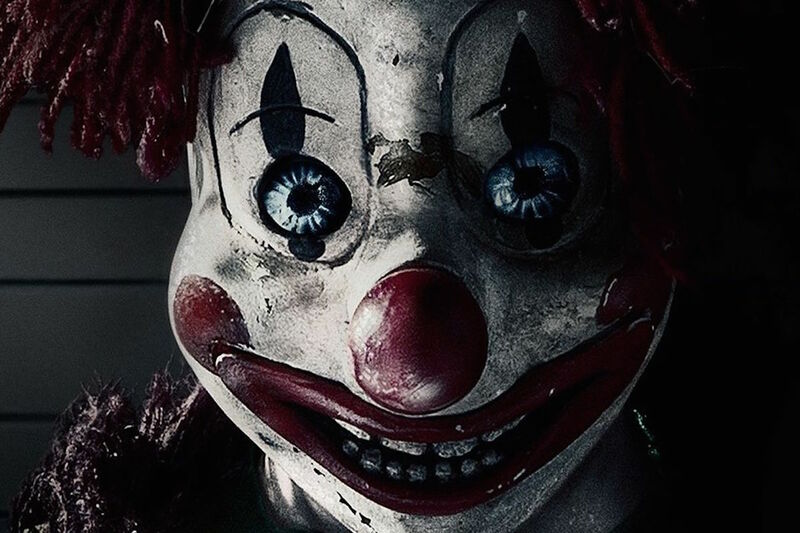 Reportedly, the mechanical clown used in the movie malfunctioned and strangled actor Oliver Robins. Robins, who played Robbie the youngest son, was supposedly almost killed because the crew thought his strangulation was just very convincing acting. Along with revealing the skeletal nature of the curse, JoBeth Williams told E! True Hollywood Story that she would return home every night after filming POLTERGEIST to find that something had tilted all the pictures in her home. “I began to think, is somebody trying to send me a message that I shouldn’t be doing this film?” Williams said. 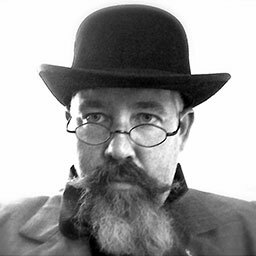 Maybe the most POLTERGEIST-like story connected to the movie belongs to author James Kahn. Kahn was tasked with writing the novelization of the movie, and he says that as he was finishing the novel, a freak lightning bold stuck the building he was working in. The success of POLTERGEIST led to a couple of sequels and a continuation of the strange events and deaths that plagued the first POLTERGEIST film. 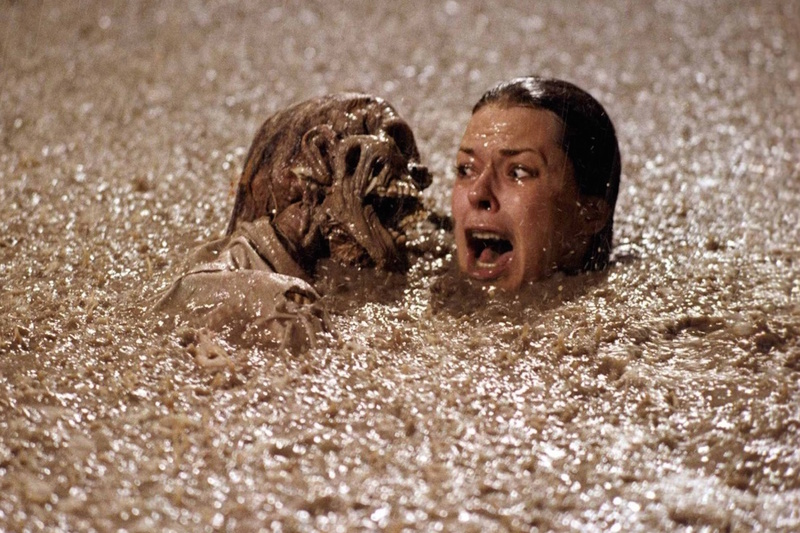 Reportedly, the crew behind the POLTERGEIST sequel used real human remains in their movie too. Will Sampson, who played the mystical Indian in the movie, was a real-life shaman. He was apparently upset enough about the curse that he delayed production for hours to perform a Muskogee Indian blessing to clear the set of Evil. It apparently didn’t work. Not only did Heather O’Rourke die years after the ceremony, Sampson himself perished less than a year later from complications from a kidney transplant. Sampson’s not the only one death connected to a sequel. 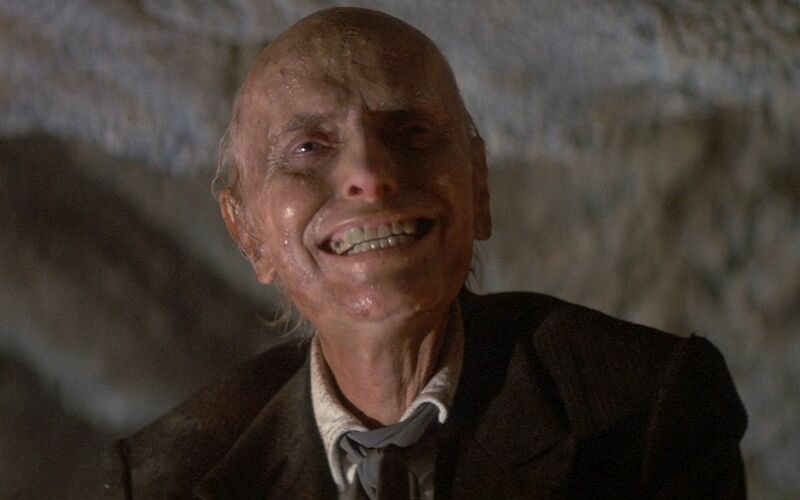 Remember the evil preacher Kane from POLTERGEIST II? There’s a reason his deathly pallor looks so realistic. The actor, Julian Beck, was suffering from advanced stomach cancer during filming and he died soon after the movie was completed. Both Beck and Sampson were older, and unhealthy to begin with, and once you get into the deaths of older actors from pre-existing conditions, the connections to a curse become pretty tenuous, but there’s one death vaguely connected to Poltergeist that bears mentioning, if only because it’s so grisly. Lou Perryman had a bit part in the original POLTERGEIST, playing a Pugsley, a construction worker. In 2009, the 67 year-old actor was chilling at his home in Austin, TX when Seth Tatum knocked on his door. According to witnesses, the two had a brief conversation and went inside together. Seth left the house alone. When police searched his residence, they found Perryman dead, his body hacked apart with an axe. Tatum seems to have chosen Perryman completely at random. In the midst of some kind of psychotic fugue, Tatum left his house and wandered aimlessly for three miles before knocking on Perryman’s door. Of all the thousands of doors he passed on his mad journey, why did Tatum pick that particular one to knock on? Maybe coincidence. Maybe something darker.